A few weeks ago I got a letter from my friend David in Western Samoa. I lived next to David in Vaitoomuli village for two years while I was a Peace Corps Volunteer. We taught at the local high school together. I trained him on Macs, because I wanted to have someone to troubleshoot the two Macs that I had donated to the school. He wondered if I could send him a color monitor, since the grayscale monitor that he is using with his Centris 610 is losing contrast. A Centris may not be much of a computer to a web-enabled reader like you, but I suspect that David is the only person in the village with a computer. The problem with sending a monitor is that it is heavy. It is expensive to ship, so it makes sense for me to upgrade David with an all-in-one computer, since the shipping is about the same as for a monitor. If money were no object, I’d send David an iBook, since it is sturdy and has a battery for backup power when the power goes down (as often happens in Vaitoomuli). That would be fast and small enough to fit into his smallish house. But I’m a student, so money is an object for me. After spending some time looking on eBay, I think I found one of the most under-rated Macs: the Power Mac 5400/120. I don’t think I could do better for David and his family. Probably the biggest attraction of a 5400/120 is the price. They regularly go for under $100 on eBay. The 5400’s mix of features makes it particularly attractive nowadays. 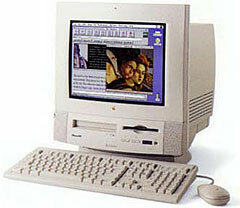 It shares an all-in-one case with the Power Mac 5200, which was introduced while I was in Samoa. 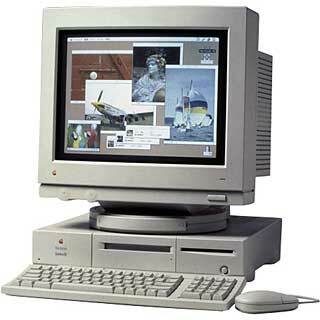 The 5200 can be thought of as a beige precursor of the iMac. In it’s day, it won design awards for it’s integrated case. It looks like a 15″ monitor with a CD-ROM and floppy drive on the bottom of the screen. The Power Mac 5400’s logic board hits a sweet spot for upgrading. Back in the late 90s, most high-end Macs used SCSI drives. SCSI offers good performance, but it’s very expensive to upgrade. Putting a large drive in one of these Macs may not make financial sense. That’s frustrating, because these Macs can be upgraded to a G3 processor for not much money. Lower-end Performas of those days used IDE drives. The bright side of IDE drives is that they are inexpensive. For example, I have a home MP3 server based on a Quadra 630 with a 60 GB hard drive. But most low-end Performas are not upgradeable to a G3. The Performas that are upgradable (like the 6360 and 6400) are relatively expensive for their performance. The 5400 is smack in the middle. It has IDE, which means that an upgrade or replacement drive will be inexpensive. Because it is only 120 MHz, however, its price is lower than a 160 MHz 6360 – even though it includes a built-in monitor. The 5400’s logic board has more in common with the high-end Macs of its day. That means that it is compatible with BeOS or GNU/Linux if David wants to try a modern operating system. Because the 5400 is older, upgrades are less expensive. I could get an inexpensive TV card so David could have a TV, too. Not to mention that the 5400 makes a decent CD player out of the box. In a few years, a G3 card for the 5400 will be really cheap, and David will get a tremendous boost in performance – and I won’t have to pay a lot for shipping, since G3 cards are small and light. In the meantime, David will have a compact Mac that runs circles around his Centris. Perhaps you have an older Mac cluttering your basement. I could use help Mac-ifying my school. I mostly want to send all-in-one Macs or PowerBooks, since they make the most sense as far as shipping. If you have a Mac that you’d like to help find a good home, email me so we can work something out.